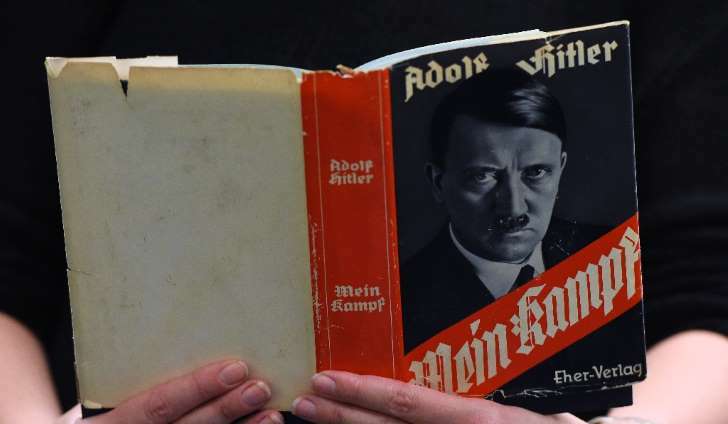 The first reprint of Adolf Hitler's "Mein Kampf" in Germany since World War II has proved a surprise bestseller, heading for its sixth print run, its publisher said Tuesday. JANUARY 3, 2017 —As a decades-long printing ban drew to a end, Adolf Hitler’s “Mein Kampf” returned to shelves in 2016 in an expanded, critical edition, becoming one of Germany’s best-selling non-fiction works of the year. The decision to revisit the manifesto, in which one of history’s most loathed leaders argues for the establishment of a superior race, was a controversial one. Bavaria gained rights to the work, the title of which translates to “My Struggle,” in 1945, after the Allies took over the main Nazi publishing house following Germany’s defeat in World War II. For 70 years, the state refused to allow further publication of the work, but at the close of 2015, it fell back into the public domain. While some argued that fully acknowledging and studying the work as a historical piece could educate younger generations about the horrors of Nazi hatred and the roots of the Holocaust, others worried that making the book readily available could bring renewed favor to its author's views, and give Neo-Nazis a piece of literature to rally around. The newly printed work, which includes annotations from historical scholars, spent 35 weeks last year on Der Spiegel’s best-seller list, selling a total of around 85,000 copies. Now, publishers say the success of the annotated version and its historical merits show that the former hope, rather than the latter fear, has largely come to fruition. Publishers initially only printed 4,000 copies, seriously underestimating public interest in the work, the AFP reported. During the 20 years between the work’s publication and its subsequent ban, some 12.4 million copies were printed in Germany, and the state began gifting copies to married couples in 1936. By the end of this month, the new edition will enter its sixth printing cycle. The edition, which contains some 3,500 annotations, has been widely discussed and read at museums, schools, churches, and memorial sites, prompting publishers to believe many who purchased it are seeking to fill historical gaps. But authorities remain wary of the double-edged sword its rhetoric presents. In Leipzig, state prosecutors have launched investigations into a right-wing publisher who began reprinting the original work, trying to determine whether they can bring propaganda charges against the company, as the Times reported. For now, publishers plan to publish the work only in German, French, and English, although they’ve been inundated with inquiries to translate the work into other languages. "It would be irresponsible to just let this text spread arbitrarily," Wirsching told DPA, a German news agency. 0 Response to "Hitler's 'Mein Kampf' becomes German bestseller"